Part of the reason I love them is, well, how could you not love fun, soft, orange pillows? The other part is that they were made to make use of some second-hand orphan scraps. This seems to be a driving force in what I am inspired to do: the more orphan the materials, the greater my drive to make use of them. I just had little bits of this soft, wide-wale corduroy so my idea was to feature it in the center blocks for these quilted pillow cases. I had more scraps of the orange medium-wale corduroy my Mom had found for me, so that was a good choice for framing the blocks. The big pillows have removable covers fully lined with an envelope back opening, for easy washing. Inside are brand new pillow forms that were still in the bag from a yard sale for 1$ a piece. The small pillows are just about all I had of this leftover upholstery scrap I was attracted to initially because of the color, then by the plush feel of it. Just as the usual argument with myself began to brew (Don’t get it just cuz you like it and it is only a quarter. What can you possibly make with that? etc, etc. ), I remembered my friend offering me pillow stuffing she had left over from a project she’d done, which I had tried to decline, feeling so proud of my restraint. Since you probably know that declining orphaned materials isn’t one of my strong points, I called her back and said “Why, Yes, I’d love to take that stuffing off your hands.” It was great stuffing, too. Not the usual fluffy white, but what seemed to be recycled textiles homogenized into a fiber stuffing that was strong and dense. Probably industrial stuffing. Similar to when I tediously make my own out of my scraps, but much nicer. Loved it. Wow, am I going on and on about used stuffing? Oh boy. 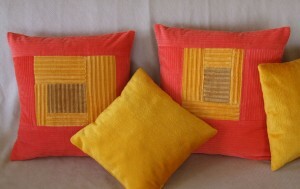 Anyhoo, to sum up the pillows: #1. cheerful, bold and bright, #2. soft and tactile, #3. (My personal favorite) Recycled and Post-consumer!!! And, since I still didn’t use up every scrap, I’m making a small baby blanket of the same motif, so you’ll recognize it when you see it. Favorite post ever! Please, there is no limit to how much you can write about stuffing! Love the pillows, but the post is classic you! !